All the Ways the Microsoft Surface 2 Is "Leaner and Meaner"
One year ago, Microsoft made waves with a new operating system built specifically for touch, then unveiled its first tablet, signaling the beginning of the Microsoft Windows RT era. On Monday, the company announced its next generation in tablet computing: the Surface 2, a slimmed-down, silver-laden model that's available for preorder starting Sept. 24 and ships Oct. 22. Considering gifting this Windows RT gadget or getting one for yourself? You'll have to decide between the original Surface with a freshly reduced price ($349, originally $499 at launch) and the Surface 2 with slightly upgraded hardware but major Skype and SkyDrive perks. The two models' tech specs go head-to-head below. 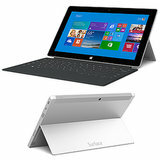 The Surface 2 is only a bit thinner (by 0.05 inches) and lighter (by 0.1 pounds). Major improvements were made to the display, which has more pixels per inch, the camera (previously referred to as "720p" quality only) for HD Skyping, the battery life, and the processor. The tablet has also shed its dark exterior for lighter silver hardware, and its kickstand now conveniently has two different viewing angles as opposed to one. The bonus extras may, however, outweigh the superficial improvements. With the purchase of a Surface 2, users will receive 200GB of Sky Drive for two years (about a $100 value) and one year of unlimited voice calling to landlines in over 60 countries, plus free Skype WiFi at two million hot spots around the world. New accessories will accompany the next-generation tablet as well. There's a new Power Cover ($200) with a keyboard, plus extra battery life built in, due for an early 2014 release. The Type Cover ($130), available for preorder on Sept. 24, also got an upgrade, with a thinner, lighter board and backlit keys. The Touch Cover 2 ($119) with soft keys is more rigid and, like Type Cover 2, is now thinner, lighter (2.75 mm thin), and backlit. Are the Surface 2's hardware and design updates enough to convince you to upgrade? Or even switch from an Android or iOS to a Windows RT tablet?